David Waldas, M.S.Ed. is an Executive Coach, workshop leader, and creator of Aligned Living. He has assisted hundreds of clients to discover their greatness and thrive in their lives. David specializes in helping clients access their Optimal Flow State and learn to utilize this state of consciousness to excel in their pursuits. David’s wide and varied career path has prepared him to step forward as an expert in his field. His experience includes: a combined ten years in the business field in management, sales, and entrepreneurship, as a small business owner/manager. Additionally, David spent twelve years as a middle and high school teacher, and three years as a varsity boys soccer coach. David’s passion of combining his business and educational experience with his very intuitive nature launched him into a successful career as an Executive Coach and workshop leader, which he has been pursuing since 2011. While David’s work experience plays an undeniable role in what he brings to his clients, there is something else that really prepared him for this career. David was born with the ability and the liability of naturally thinking outside of the box. He spent many years training himself to understand and integrate into the main stream. Through a long series of trials, navigating through many successes and a healthy dose of wisdom building failures, David has found the access point to Optimal Flow State. That consciousness where ordinary and non-ordinary reality converge. It has become his passion to teach others how to live and operate in this space. David has now dedicated his career to teaching this access point through his Aligned Living system. He has a vision of how the world can change as more and more of us live in our Optimal Flow States and the natural shift in perspective that comes with it. 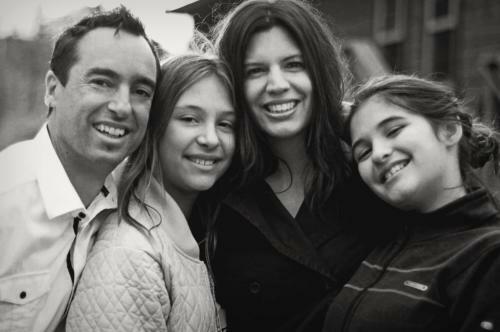 David, a native of central New York, spent most of his adult life in Colorado, and now lives in Encinitas, California with his wife Tracy and their two daughters, Olivia and Ava. Stay Informed - Receive David's latest Blogs and Videos!